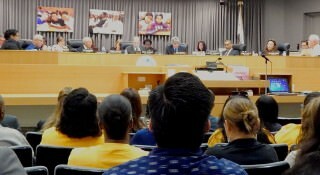 The LA Unified school board is meeting in open and closed sessions tomorrow, with plans to consider amendments to the Local Control Accountability Plan and adjustments to the fiscal stabilization plan. In the brief open session, the school board will take up clarification amendments to the LCAP plan as required by the Los Angeles County Office of Education. In closed session, the members will review progress on matters relating to the search for the next superintendent. The LCFF investments are targeted to low-income, English learner and foster youth students. And, money is going toward expanding arts programs, providing librarians and library aides, reducing class sizes for 8th and 9th grade English Language Arts and Mathematics, increasing counseling support and providing intervention and support programs to youth on their path to graduation.